Yum! I remember having these cookies a few years ago. So buttery and chewy. Great cookies, and great photos elmomonster! You mention that these cookies include “palm oil butter blend”. Did you know production of palm oil is responsible for the widespread destruction of rainforests in Southeast Asia? Rainforests are being destroyed and replaced by monoculture oil palm plantations. Species which used to live in the rainforests, such as orang-utans, tigers, elephants and rhinos, are facing extinction due to habitat loss. Perhaps you should think about that next time you enjoy these cookies with “palm oil butter blend”. I love Souplantation. Just went there a few days ago for their special Strawberry menu. Love the strawberry salad and strawberry muffin (and strawbery green tea & strawberry lemonade... yum). I don't really remember seeing those cookies. I'll pay closer attention next time I go. Definately want to get a bag to try. Souplantation actually has some decent stuff. I use them sort of as Elmo does, as a big culinary purge and reset, if that makes any sense. As far as the cookies go they've been around as long as I can remember and quite often the workers will go around and hand them out for free right after a batch comes out of the oven . . . one or possibly two cookies per customer. And, without knocking Souplantation's cookies in any way, I will say, Elmo, that you will have to try my homemade ones sometime. Did you also know that palm oil production is the major means of income of these Southeast Asian countries and by boycotting these products you are crippling their main export and thus their economy. Of course it is a major problem that forests are being destroyed but until a plan that can properly ensure a stable economy while preserving the ecosystem has been made, don't be so judgemental! Oh and lovely post elmo I really don't remember how these cookies taste but your description makes them sound truly perfect, chewy and buttery and soft! Wah, you just awakened my cravings again! Those cookies look heavenly. WHY YOU ASK? BECAUSE THESE COOKIES ARE HORRIBLE. I CAN'T EVEN TASTE THE CHOCOLATE CHIPS...AND COMPARING THESE COOKIES TO MRS. FIELDS? ARE YOU SERIOUS?!?!? Hey thanks! At this moment, I wish I had another bag! I deleted your first and more diplomatic comment from my blog. It looked like a bot wrote it (and I've been swamped with bot spam), so that's why I got rid it. However, it sounds like you're a real live person with something to say. But while I appreciate your opinion, my food blog is not the appropriate forum to debate anything other food. Those are good too! Except they're a lot harder to take out! If you're already inside the restaurant, definitely taste them there! However, if you're just coming in specifically for them, bypass the line and go all the way up to the cashier! I'm sold. Let me know when you've baked a fresh batch! Hey thanks for providing the counterpoint and for having my back! Always good for people to hear both sides of an issue. They are heavenly. And probably, like all other things good, not good for you either. Whoa! McDonald's?! HA! Well, at least you didn't say Chips Ahoy! 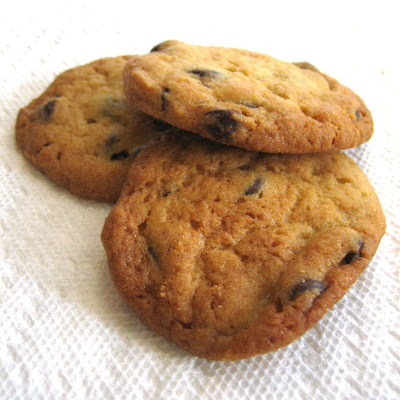 My general philosophy is if you don't have them all that often, go ahead and enjoy cookies with butter or palm oil. Just don't make the mistake of thinking they're any healthier. evil, evil cookies... Souplantation also makes evil cornbread too. McDonalds has really good cookies! 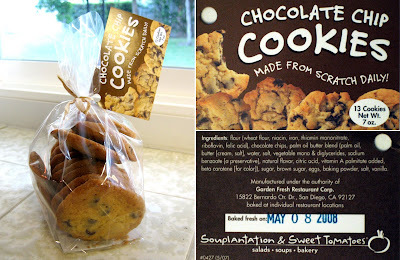 ^^^First, I agree that the cookies sold at Vons and Pavilions in those transparent plastic containers are very good, esp. if you get a fresh batch. Peanut butter and sugar are two varieties I'd recommend. Don't know if all stores follow the same recipe but the Vons @ Adams and Harbor in Costa Mesa and the Pavilions on Beach Blvd. in HB are with the program. Second, this thrifty NYC boy/buffet lover finally went to the Souplantation on Main Street in Irvine in March, and it was just the awesome carbohydrate-loaded/meat-devoid experience I was eagerly anticipating. I walked out of there on a Saturday at about 1:00, and didn't eat again for the rest of the day. I get set adrift on memory bliss just when I eyeball those Souplantation coupons you see inside Sunday's newspaper. oh yeah, can't forget COSTCO! Word. I don't know why butter isn't used whenever possible. Grandma knew best! You said it. I love the cornbread there too...slathered with plenty of that whipped butter, of course. Okay, yeah, the Costco cookies are also damned good. We buy them all the time. Except I just wish they were crispier. I'm of the crisp-cookie camp...less the chewy. I'll have to check out Pavillions. Though I'm not shocked that there are good cookies there...Pavillions makes the most awesome cheesecake! I live the cornbread with the Honey Whip on it. Ah yes. Honey whip. Taking something good, even better. Crispy cookies don't last long around me either. BTW, there are often buy 1 get 1 free coupons in the mail or Sunday OC Register (not always) for Soupplantation. I am a big fan of souplantation and i always prefer souplatation while eating out.There bakery products are so fresh and so yummy.And i always keep an souplantation discount coupons with me by which i can save good money on food.